Large print and low vision games keep people engaged socially and mentally. They are an important and fun way to keep those with macular degeneration interacting with other people and to keep their minds active. Have you become concerned that your friends no longer want to play cards with you because you are having difficulty seeing your cards? Don't let macular degeneration keep you from doing activities that you enjoy. Playing with large number or low vision cards is one way to keep your mind active and your social life vibrant. See the difference between regular cards and large print ones? It is vital to your emotional and mental health. Often people with age related macular degeneration become depressed - for many different reasons. But one of them is that they often isolate themselves and stop participating in hobbies, games or activities that they enjoy. Remain actively involved in activities that stimulate the mind while enjoying the company of friends - whether it is with your local bridge club or playing poker with the guys. Depression is often experienced by people with macular degeneration because they have given up on activities they enjoy and have become more isolated and alone. Keep finding ways to adapt to your vision loss. Continue to enjoy your favorite card games with cards that have large, bold numbers. Let your friends know about your macular degeneration and explain to them how it affects the center of your vision. Perhaps you play cards with or know someone who has macular degeneration. Buy a deck of low vision cards and suggest you use them the next time you play. You can keep playing your favorite card games like Hearts or Solitaire by simply replacing your deck of cards with ones that have large bold numbers, making it easier to see, but not necessarily easier to win. Read this review by Joan Gayle: "This product has been a real help to an uncle of mine who has macular degeneration of the eyes, but loves to play cards. Ask your friends to use low vision bridge cards or large print playing cards to make it easier for you to see. Now, if you keep winning, they may want to go back to the regular cards :). Be open about your macular degeneration and your vision losses. Talking about your macular degeneration and explaining how it affects what you see and how you see helps others to be more understanding. Rummikub is one of my father-in-law's favorite games. (How this game got it's name I'll never know). He has wet macular degeneration and the big bold numbers on this large print edition makes it much easier for him to play. The tiles are set and displayed on a stand so there is no need to hold a handful of cards. This game is played many times during the week especially on cold, winter nights in Wisconsin. 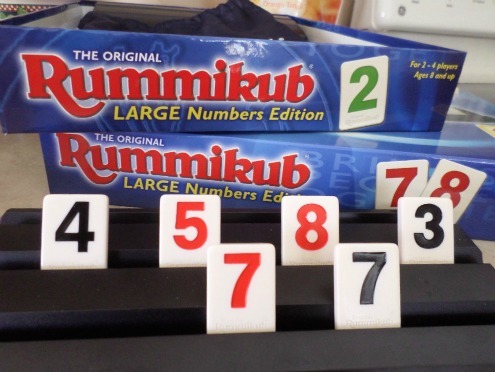 Playing games like Rummikub is a great way to keep your mind active and challenged. I know I just said that Rummikub was our favorite game, but it really might be Sequence. I have a neat story to tell you about this game. Many years ago we had received the game as a Christmas gift and really enjoyed playing it. A couple of months later a friend of ours was driving through Atlanta and wanted to stop and see us. One evening we asked if he wanted to play Sequence, and he readily said yes. After he asked us several questions about why we liked the game, we found out that indeed, he, Doug Reuter was the inventor of the game. You play in teams of 2 if more than 2 are playing. A little bit of luck, and some strategic thinking is needed to win. 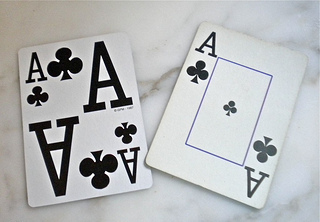 Sequence can be played with 2, 4 or 6 players. If you like word games, like Scrabble, get the large tiles for easier viewing and hopefully better spelling. You can buy extra large tiles with bold, black letters and numbers set on a white background. Perfect for those who love to play Scrabble but are having trouble seeing. These tiles are compatible with your Scrabble board game. As one reviewer said,"For those who enjoy playing scrabble but have some visual issues, these tiles are just the ticket. The letters are large, and the black on white combination makes the letters jump out at you and easy to see. So, playing Scrabble is a pleasure rather than a strain." Keep your mind sharp by playing the strategic game of backgammon. This larger backgammon set is available in better contrasting colors - black and white rather than the traditional brown. The more contrast the easier it is for those with macular degeneration to see the chips. The larger size board and chips makes this a better choice for those with low vision. Bello Games New York, Inc. Deluxe Giant Backgammon Set 21"
The numbers on these large heavy-duty bingo cards are black against a white background, making them easy to find when your numbers are called. These cards are great if you are looking for a game that will work with a large group of people. Use them at your senior center for an activity. Be sure to have some prizes for the winners. You can purchase large print crossword puzzles from Amazon. Games and puzzles can be very beneficial to someone with macular degeneration. In this case, cross word puzzles are a great way to keep the mind engaged and challenged. The old saying of "use it or lose it" is very true for our senior population. These inexpensive puzzle books come in large, bold print so that those with low vision won't be struggling to see the words - but will find their minds challenged and engaged. Have fun with these low vision games and keep your mind and brain active. 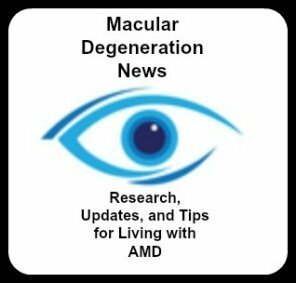 Don't let macular degeneration be an excuse to stop having fun with your friends and family.